Welcome to the Board Results 2019 page. Well, we have given the up to date news regarding 10th, 11th and 12th Exam Results 2019 from this page. A huge number of students are recommended us to provide the 10th, 11th and 12th Board Exam Results 2019on a single page. So, to help the candidates, we have created the current article and updated all Board Exam Results 2019. Therefore, without late keep an eye on the below section attentively and grab the valuable news. Many of the students had participated in the 10th, 11th and 12th Examinations 2019. And now all the participants are deeply searching for Board Results 2019 (10th, 11th and 12th Exam Results) on various sources. For the sake of candidates, we have given the Board Results for All the States. So, keep calm and check out the Board Results 2019 from this page. When compared to the previous years, many of the students had taken part in the 10th/ SSC/ SSLC/ Madhyamik Examinations 2019 on scheduled dates. Right now, all the candidates are anxiously waiting to check their status. So, for the convenience of students, in this section, we have arranged all state boards in a tabular form. So, this process will be very helpful for the students at the time of checking the 10th/ SSC/ SSLC/ Madhyamik Board Results 2019. Moreover, 10th Standard is mandatory for all the candidates. Each and every candidate have shown their best performance in the Examinations. Currently, all the contenders are very busy in finding the Results. So, to help the students in their tough time we have bundled a lot of stuff from this section. So, all the interested students can take a look at the below section and find their Status. Coming to the Intermediate Junior session, a huge number of candidates had performed well in the examinations. And now all of them are curiously waiting to check the Board Results. Many of the Organizations are planning to release the 11th/ Intermediate 1st Year/ +1/ Junior Inter Board Results 2019 in upcoming months. Moreover, some of the officials are planning to Release the Board Result in few more days. Exactly, this is the Board Results time. So, at any time, the authorities may Release the Results. Moreover, many of the students are facing some of the issues at the time of checking the Results. So, to avoid that problem we have shared the working links on our website. Simply, click on the links and check the Results. So, in this section aspirants can get the genuine 12th/ Intermediate 2nd Year/ +2/ Senior Inter Board Results 2019 Links. Moreover, students can check the accurate Board Results 2019 links from here. Moreover, we have tried our level best and gathered the complete information and equipped in this section. Without late, all the students are suggested to take a look at this page and find out their status. Meanwhile, a vast number of students and college students are depending upon our website. So, to give the genuine information, we have tried our level best and bundled a lot of stuff from here. Therefore, interested contenders can keep an eye and follow the below-given table. 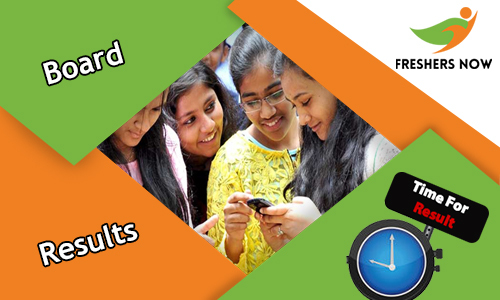 Stay connected with our website Freshers Now in order to get all the Board Results 2019 (10th, 11th and 12th Exam Results) across India.